In the previous article (http://ponnadi.blogspot.in/2012/10/archavathara-anubhavam-nammazhwar.html) we observed nammAzhwAr's archAvathAra anubhavam. Let us now see madhurakavi AzhwAr's archAvathAra anubhavam. There are two levels of nishtai - pratham parva nishtai and charama parva nishtai. prathama parva nishtai which means being completely focussed on emperumAn all the time. charama parva nishtai which means being completely focussed on AchAryan/bhAgavathas all the time. While all the AzhwArs are situated in prathama parva nishtai madhura kavi AzhwAr and ANdAL are explained by our pUrvAchAryas as being situated in charama parva nishtai. ANdAL identifies in nAchiAr thirumozhi that emperumAn kaNNan is "vittuchiththar thanGgaL dhEvar" (விட்டுசித்தர் தங்கள் தேவர்). Because periyAzhwAr liked and showed kaNNan, ANdAL says she is also following him. Anyway, we will discuss ANdAL's nishtai in some other occassion. madhurakavi AzhwAr was fully surrendered to nammAzhwAr and he was fully satisfied . This is explained by piLLai lOkAchAryar in srivachana bhUshaNa dhivya sAsthram in sUthram 408 and 409. Let us take this opportunity to first establish madhurakavai AzhwAr's greatness before going in to his archAvathAra anubhavam. piLLai lOkAchAryar, in the last prakaraNam, is discussing the highest nishtai that AchAryan is upAyam and upEyam for AchArya nishtars. For that he compares madhurakavi AzhwAr with other AzhwArs. 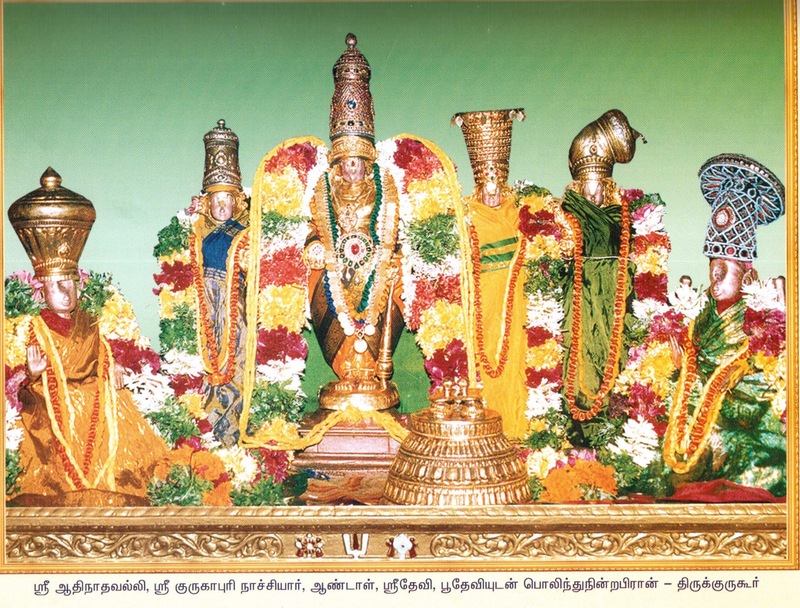 Without mAmunigaL's vyAkyAnam, we cannot clearly understand the meanings of these sUthrams. Let us immerse ourselves a little bit in mAmunigaL's beautiful vyAkyAnam. Here eating (unNda) means having bhagavath anubhavam and not-eating (unNnNAtha) means not having bhagavath anubhavam. Because for AzhwArs "unNnNum chORu parugu NIr thinnum veRRilai ellAm kanNnNan" (உண்ணும் சோறு பருகு நீர் தின்னும் வெற்றிலை எல்லாம் கண்ணன்). AzhwArs in general, are bhAgavatha nishtars only. When they are happy (unNdapOthoru vArththai), in many pAsurams, they glorify bhAgavathAs. For example, nammAzhwAr says "payilum piRappidai thOrum emmaiyALum paramar" (In every birth they will be my swAmys), "varumaiyum immaiyum nammai aLikkum pirAkkaL" (in future and the present, they are the protectors for us), etc. Other AzhwArs have also glorified bhAgavathAs very much when they are happy. But when they dont have bhagavath anubhavam (unNnNAthapOthoru vArththai), out of desperation to see emperumAn and out of their unbearable sorrow, they have said some harsh words to emperumAn and also to bhAgavathAs. For example, nammAzhwAr calls garudAzhwAr as "venjiraippuL" (because he uses his wings to fly away carrying emperumAn from AzhwAr), etc. AzhwArs also become bewildered when they dont have bhagavath anubhavam out of the immense sorrow they go through. They have so much attachment for emperumAn which is unimaginable for us, that when they dont have bhagavth anubhavam they are completely shaken up. It is shown in the vyAkyAnams that just like we are completely shaken up when our material desires are not fulfilled, AzhwArs are completely shaken up when there is no bhagavath anubhavam for them. 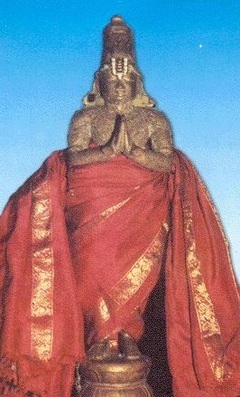 Unlike other AzhwArs, madhuravaki AzhwAr was fully situated in nammAzhwAr. So, he was always happy and said "dhEvumaRRaRiyEn", "nAvinAL naviRRu inbam eythinEn", etc. That being said, archAvathAra emperumAn is so powerful that he can even attract such AchArya nishtars towards him. This is explained in the 3rd pAsuram of kaNNinun chiruththAmbu. "Even taking my eyes off nammAzhwAr, I will enjoy the blackish beautiful thirumEni of the swAmy of nithyasUris. I got this great benediction (of seeing emperumAn) because of my subservience to kurugUr nambi (nammAzhwAr)." 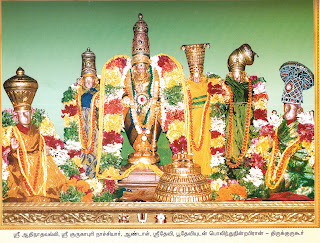 AdhinAthan emperumAn, nammAzhwAr and madhurakavi AzhwAr are all residing in AzhwAr thirunagari. 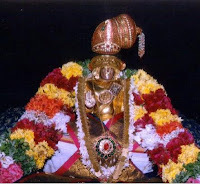 For madhurakavi AzhwAr, AzhwAr thirunagari is paramapadham (because of AzhwAr's presence) as shown by himself in the last pAsuram as "vaikuntham kANminE". It is explained in the vyAkyAnams that due to the fact that bhAgavathAs are so attached to emperumAn and vice versa, naturally, bhAgavatha nishtars will have attachment towards emperumAn and bhagavth nishtars will have attachment towards bhAgavathAs. In the next article we will see kulasEkara AzhwAr's archAvathAra anubhavam.